Construction tool tracking doesn’t have to be a hard process. New technology allows contractors to track tools in new and simple ways. However, there are a couple key factors that construction companies should focus on when setting up new tool tracking systems. This article outlines these keys to success. Are you still using old Excel documents? How about antiquated sign out sheets and clipboards? If so, do you find that they are constantly out of date and therefore almost useless? Read on to learn how other contractors have moved away from these old approaches to tool tracking. New modern apps have changed what is possible in construction tool tracking. Taking advantage of the power of smart phones that employees already have these phones offer a much more efficient way to check tools out of the warehouse. Most importantly they also allow you to track tools as they move from person to person in the field. 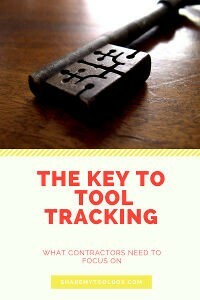 The field is where tool tracking is really needed for contractors. Read on to learn where to focus if you are ready to try a modern approach to construction tool tracking.